As electronic systems evolved to mobile devices the importance of analog has grown. Interfacing with the real world via cameras, touch, gesture controls, audio and video applications all require analog functionality. Power management IC’s are critical to the success of these devices. These growing applications have added significant volumes to the analog unit sales. While manufacturers of mobile devices place power reduction at the top of their priority list to extend battery life, OEM’s are also focusing on increasing the efficiency of products to get the highest energy star rating. This move to produce greener products is helping to put analog circuits at the forefront of system designs. Even the companies themselves are taking pride in being green. In 2012, Newsweek magazine ranked the top 100 greenest companies in the United States. Analog Devices was 19th, an achievement they are very proud to have. There continues to be demand for analog circuits across all application categories. We find analog products in garage door openers to white goods, to portable electronics, to automotive and communication products. Analog circuits are truly pervasive and ubiquitous throughout the marketplace. While smaller, faster and lighter are attributes most commonly touted by semiconductor companies, when it comes to analog circuits that is not always the case. For the most advanced logic chips, manufacturers continue to drive down process technologies to sub-20nm nodes. On the other hand, for many of the general purpose analog products, the oldest process technologies are still used. Analog products will continue to utilize a broad spectrum of manufacturing process technologies in the foreseeable future. Analog circuits have obtained the unique position of being able to offer products utilizing 1 µm or larger technology down to state-of-the-art 40 nm and smaller designs. 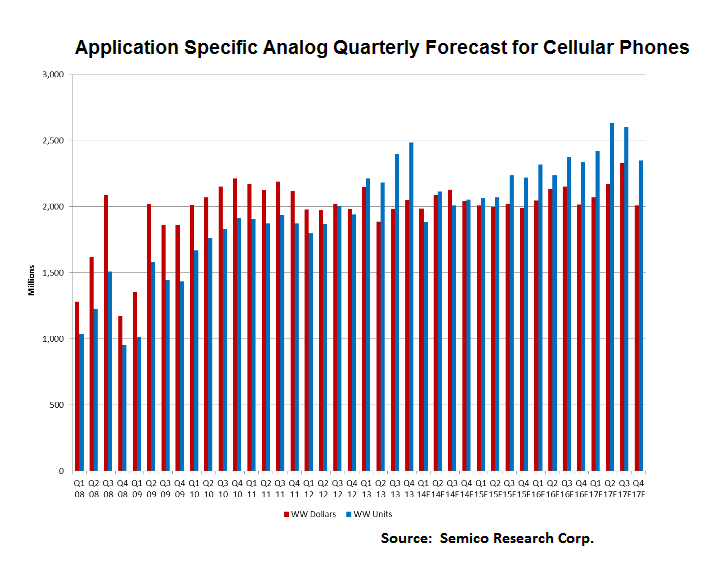 This report breaks down the analog market into 35 markets with forecasts out to Q4 2016. It also covers 52 foundry, IDM or fabless companies participating in the analog market.